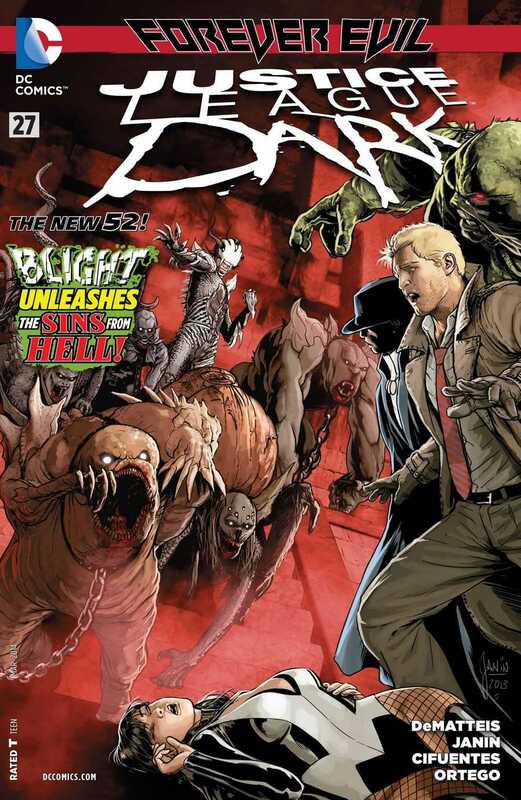 I have sadly not kept up with Pandora and Constantine, which are also a part of the Forever Evil: Blight event, so going into this issue I was slightly lost, but DeMatteis does an excellent job of catching readers up with what has happened. And he does it in the best way possible: just a couple sentences of dialogue, and an editorial shoutout. He keeps it extremely brief, which is just as it should be, and he goes straight into the main story. I was surprised with the direction that this issue took. I was expecting things to go on for much longer but DeMatteis provides here a definitive battle against Blight in which all the current members of the Justice League Dark, plus the Angel Zauriel, get to do their part. With his work on Phantom Stranger, DeMatteis introduced the concept that all the bad things that happen whenever the titular character sets out to do some good all have a place in God’s larger plan. References often as The Presence, the question has come up several times in previous issues about what He is doing to combat Blight and the Crime Syndicate. Well, we find that out here in these pages. Everything, whether it is Chris Esperanza’s resurrection or the Stranger’s double-dealings with Blight, etc, have all been to create that perfect moment where His plan crystallises. Speaking of the action, Constantine and Nightmare Nurse do a really full-on intense battle against Blight in this issue. And they hold nothing back. Not even the deepest darkness of their souls. How do you fight the very embodiment of evil? That’s the question that these two characters these try to find an answer to. And they almost succeed. Because there’s a great twist involved that plays up to these characters’ strengths and shows them doing the right thing. There are a lot of layers involved to the story in this issue. We see several plans coming together for a big twist in the final pages but I have a feeling that despite the big definitive fight, things aren’t quite over. They can’t be. We still have several issues to go before the Forever Evil: Blight crossover ends and I can see how things would take a big about turn once again. One of the things that I loved here was Deadman and Swamp Thing going up against Blight. They don’t get a lot of attention sadly, but they get some really nice action scenes, especially the ones where Swamp Thing transforms into a giant whale and fights a monster-sized Blight. I loved those particular scenes so much. I’m a fan of Swamp Thing now. Speaking of the art. Mikel Janin with Vicente Cifuentes, Guillermo Ortego and Jeromy Cox have an excellent issue on their hands once more. Several panels here involve Blight manifesting as a smoky, shadowy snake, whether in the material world or the metaphysical one, and those are some great scenes because of the white/black shaded contrast. And the final few pages, which are packed with rainbows of colours, do a great job of setting their own contrast to the rest of the issue. Thematically, there are a ton of reasons to like Justice League Dark #27 as far as the art is concerned. These four are a great team, and I love seeing their work month after month. The issue ends on an amazing cliffhanger that finally shows where the rest of the original Justice League Dark is. Zatanna, Madame Xanadu, Black Orchid and Frankenstein have been missing since the events of Justice League #23, which marked the end of Forever Evil, and we finally learn their fate. I loved that ending. More Justice League Dark: Volume 1, Volume 2, Volume 3, #22-23, #24, #25, #26. Posted on January 29, 2014, in Comics Reviews, Review Central and tagged Black Orchid, Blight, Comics, Comics Review, Constantine, Crime Syndicate, Crime Syndicate of America, DC Comics, Earth 3, Evil, Forever Evil, Forever Evil: Blight, Frankenstein, Guillermo Ortego, Horror, J.M. DeMatteis, Jeromy Cox, John Constantine, Justice League, Justice League Dark, Madame Xanadu, Mikel Janin, Mystical, Nan Madol, New 52, Nightmare Nurse, Phantom Stranger, Review, Review Central, Sea-King, Superheroes, Supernatural, Swamp Thing, Trinity of Sin, Vicente Cifuentes, Zatanna. Bookmark the permalink. 10 Comments.